Visiting the National Naval Aviation Museum in Pensacola, Florida was like taking a step back in time. As soon as we drove onto the navy base, there was an overwhelming patriotic feeling that came over us. Service men and women risk their lives every day and the museum is one of many ways they are honored. Admission to the world’s largest Naval Aviation museum is free, so it makes for a great family outing or group excursion. We were greeted immediately upon entering the state-of-the-art museum by very polite and well dressed volunteers. Our group chose to walk through on our own but on my next visit, I will take the tour. The 350,000 square feet exhibit is on 37-acres and it took us over 2 hours to do a complete walkthrough. The Museum showcases over 150 restored planes representing the Navy, Marine Corps and Coast Guard Aviation. In addition to the planes, the museum is home to flight simulators, Blue Angels X4D Experience and my favorite, the Virtual Flight Deck. The Flight Deck exhibit was a brief look into the operations “on board” an aircraft carrier. That is the closest I will ever be to experiencing the wind, smell and rumble of an aircraft catapult. Growing up in the area, the Naval Aviation Museum is something that I visited often with my family when I was younger. I was always intrigued by the amazing collection that the museum had put together, but it has been many years since I have been to museum and I honestly didn’t know how much I would enjoy it as an adult. Well, I can absolutely say that even as an adult visiting the Naval Aviation Museum is an awe inspiring day trip. I wouldn’t consider myself a history buff by any stretch of the imagination, so I was surprised by how the history grabbed me on this trip. The museum’s collection of airplanes and naval artifacts is staggering with over 150 aircraft stored from floor to ceiling. I was most interested in the Curtiss NC-4 which was the first aircraft to fly across the Atlantic Ocean. The NC-4’s trip took 19 days to complete and started in New York State and ended in Lisbon Portugal. The Naval Aviation Museum has also worked hard to add interactive attractions. The IMAX theatre offers three films with a showing every hour beginning at 10:00am and ending at 4:00pm. I was talked into taking a literal spin on the flight simulator which puts you and another person in the cockpit of a fighter jet on a training mission. I also enjoyed the virtual aircraft carrier simulation which walks you through the enormous efforts it takes to operate an aircraft carrier as well as a simulation of the conditions experienced by the crew on the flight deck. All in all, it was a very interesting trip and I was surprised by just how much I still enjoyed the museum as an adult. Any travelers looking for a fun day trip off of the beach will not be disappointed with a trip to the Naval Aviation Museum. We hope you find this information useful. 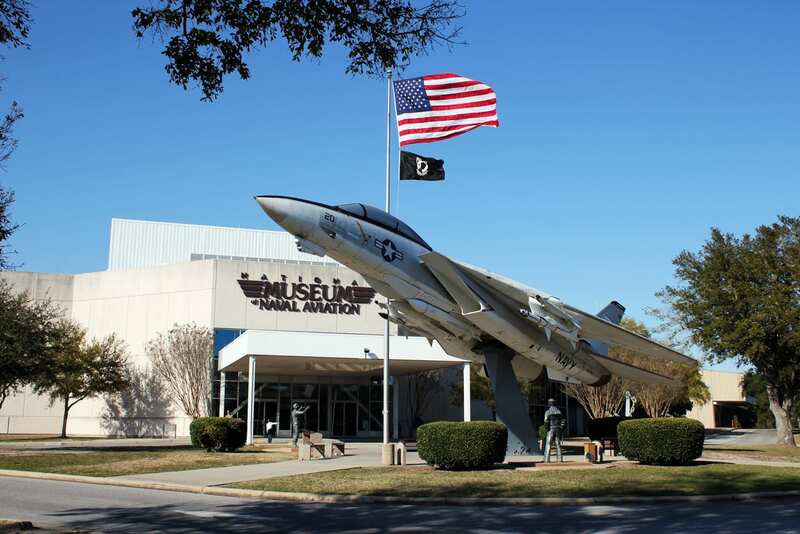 Plese leave us a comment if you have tips or suggestions on the National Naval Aviation Museum. Click the link below to read about additional day trips along the Alabama Gulf Coast.